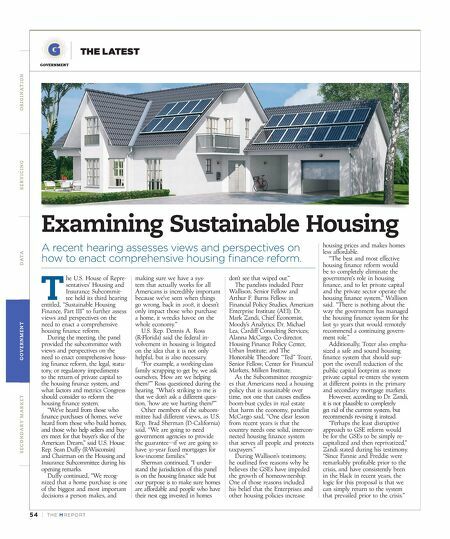 54 | TH E M R EP O RT O R I G I NAT I O N S E R V I C I N G DATA G O V E R N M E N T S E C O N DA R Y M A R K E T THE LATEST GOVERNMENT Examining Sustainable Housing A recent hearing assesses views and perspectives on how to enact comprehensive housing finance reform. T he U.S. House of Repre- sentatives' Housing and Insurance Subcommit- tee held its third hearing entitled, "Sustainable Housing Finance, Part III" to further assess views and perspectives on the need to enact a comprehensive housing finance reform. During the meeting, the panel provided the subcommittee with views and perspectives on the need to enact comprehensive hous - ing finance reform, the legal, statu- tory, or regulatory impediments to the return of private capital to the housing finance system, and what factors and metrics Congress should consider to reform the housing finance system. "We've heard from those who finance purchases of homes, we've heard from those who build homes, and those who help sellers and buy - ers meet for that buyer's slice of the American Dream," said U.S. House Rep. Sean Duffy (R-Wisconsin) and Chairman on the Housing and Insurance Subcommittee during his opening remarks. Duffy continued, "We recog - nized that a home purchase is one of the biggest and most important decisions a person makes, and making sure we have a sys- tem that actually works for all Americans is incredibly important because we've seen when things go wrong, back in 2008, it doesn't only impact those who purchase a home, it wrecks havoc on the whole economy." U.S. Rep. Dennis A. Ross (R-Florida) said the federal in - volvement in housing is litigated on the idea that it is not only helpful, but is also necessary. "For example, a working-class family scrapping to get by, we ask ourselves, 'How are we helping them?'" Ross questioned during the hearing. "What's striking to me is that we don't ask a different ques - tion, 'how are we hurting them?'" 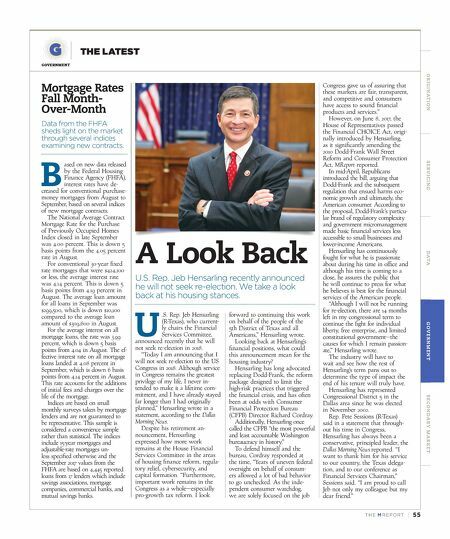 Other members of the subcom- mittee had different views, as U.S. Rep. Brad Sherman (D-California) said, "We are going to need government agencies to provide the guarantee—if we are going to have 30-year fixed mortgages for low-income families." Sherman continued, "I under - stand the jurisdiction of this panel is on the housing finance side but our purpose is to make sure homes are affordable and people who have their nest egg invested in homes don't see that wiped out." The panelists included Peter Wallison, Senior Fellow and Arthur F. Burns Fellow in Financial Policy Studies, American Enterprise Institute (AEI); Dr. Mark Zandi, Chief Economist, Moody's Analytics; Dr. Michael Lea, Cardiff Consulting Services; Alanna McCargo, Co-director, Housing Finance Policy Center, Urban Institute; and The Honorable Theodore "Ted" Tozer, Senior Fellow, Center for Financial Markets, Milken Institute. As the Subcommittee recogniz - es that Americans need a housing policy that is sustainable over time, not one that causes endless boom-bust cycles in real estate that harm the economy, panelist McCargo said, "One clear lesson from recent years is that the country needs one solid, intercon - nected housing finance system that serves all people and protects taxpayers." During Wallison's testimony, he outlined five reasons why he believes the GSEs have impeded the growth of homeownership. One of those reasons included his belief that the Enterprises and other housing policies increase housing prices and makes homes less affordable. "The best and most effective housing finance reform would be to completely eliminate the government's role in housing finance, and to let private capital and the private sector operate the housing finance system," Wallison said. "There is nothing about the way the government has managed the housing finance system for the last 50 years that would remotely recommend a continuing govern - ment role." Additionally, Tozer also empha- sized a safe and sound housing finance system that should sup- port the overall reduction of the public capital footprint as more private capital re-enters the system at different points in the primary and secondary mortgage markets. However, according to Dr. Zandi, it is not plausible to completely get rid of the current system, but recommends revising it instead. "Perhaps the least disruptive approach to GSE reform would be for the GSEs to be simply re - capitalized and then reprivatized," Zandi stated during his testimony. "Since Fannie and Freddie were remarkably profitable prior to the crisis, and have consistently been in the black in recent years, the logic for this proposal is that we can simply return to the system that prevailed prior to the crisis."